Having grown up in Paddock Wood, I was for the most part unaware that just up the road at the tiny, rural All Saints’ Church in Tudeley I would have found the only church in the world to have all its twelve windows decorated by the Russian artist Marc Chagall. When I became a Christian in my late teens, All Saints’ became a regular place for me to pray. It is, quite simply, one of my favourite places to sit and be in the whole wide world. The windows are just beautiful and deeply enchanting. Commissioned as a memorial tribute to Sarah d’Avigdor-Goldsmid who died aged just 21 in a sailing accident off Rye, the main East window shows Sarah drowning in the sea while Christ crucified looks down. I don’t know much about art (or anything really) but I love the combination of honest brutality in showing Sarah’s plight in the midst of such beautiful stained glass. Sanitised Christianity this is not. I write about this now because I had a chance this week to visit a special exhibition called Cross Purposes. Much kudos to my old mother church, St. Andrew’s Paddock Wood, who have combined with my old school and their art gallery, Mascalls Gallery, to put on a special exhibition. In the Gallery, Cross Purposes has brought together powerful images of the crucifixion from some of the most important artists of the 20th and 21st Centuries. I was astounded to see the list of names – Stanley Spencer, Tracey Emin, Eric Gill, Maggi Hambling, Emmanuel Levy and (of course) Marc Chagall. 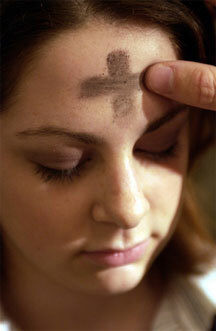 Ash Wednesday today and the start of Lent. I did my best to explain the 40 days ahead to a group of fourteen and fifteen year olds girls this morning in a local school’s assembly at 8.30 in the morning when I’m not sure who was the least awake and compos mentis – them or me. As things currently stand, Ash Wednesday is not a particularly big deal in this part of the world and the low evangelical leanings of this particular parish and this particular deacon means that Lent isn’t that much closer to the surface of consciousness either. I do regret that in many ways and have been taking gentle steps locally to try and bring this 40 day opportunity for a spiritual ‘health-check’ into the forefront of people’s thinking at the present time. Ridley Hall have published a new Lent book ‘Cast of the Kingdom’ to which I contributed last year whilst still at college and for which I also happen to have been one of the co-editors. I’ll be using it during Lent and have encouraged our church members to do likewise. I’ve also pushed the CHP Love Life, Live Lent course and we have a few people taking up the challenge to do that each day. My family and I are going to be following the family book as best we’re able together, incorporating it into our evening meal routine. Well, I did get signed up to the SMS service and so each morning around half eight, I get a text from Love Life Live Lent (or L4 as I’m calling it for short) with my little task for the day. It’s quite cool to be getting the texts – it feels a bit Mission-Impossible-esque; your task for today should you choose to accept it etc etc. Here on this blog I try to post once or twice a week with things that really interest me. I didn’t want to change that pattern for myself or regular readers here by clogging up this blog (blog-clog?) with daily posts about how my daily tasks are going. So, thanks to my old friends WordPress, I’ve set up a temporary site over at wannabelovelifelivelent.wordpress.com where I will record my daily success or failure to engage with my L4 tasks. For those that are interested, stick it in your RSS reader now. Does the Church of England know when Lent starts? I was surprised to see this press release hit the wires this morning when the Church of England announced Lent had begun! The Love Life, Live Lent campaign began with a call to carry out action number one on day one – namely to make someone laugh. Regular readers will know that I had some ‘back and forth‘ with the CofE’s Communications Unit a few weeks ago over the technicalities of their website and SMS service. Indeed, as part of it, I was challenged to ‘follow the daily suggestions’ by Ben Wilson from the Comms Unit so how can I do anything but pick up that challenge. Indeed, I have made someone laugh today. Indeed, a couple of people. For a kick-off, there was the always fun chance to spend some time playing with my two year old daughter and tickling her – which is always guaranteed to make her laugh like a drane. I also related to a couple of ordinand colleagues the story of how (the very funny) Dave Gorman tried to make the world a better place by carrying out actions suggested to him by members of the public. In one particularly memorable attempt, he broke the speed limit and received a Â£175 fine and then stood at Piccadilly Circus wearing a sign confessing his crime. Apparently one of his correspondents believed making criminals advertise their sins would make the world a better place. I remember from Dave’s account of the plan in his stand-up show that various tourists had photographed him and had thought it was really part of the British judicial system. Indeed, some of them thought it was a great idea that they wished they had at home. It made my colleagues laugh. Anyway, quite apart from completing my first challenge successfully, I do have to ask the question of my colleagues in the Church of England Comms Unit and Publishing division as to when they think Lent actually starts? In the Western Church (which I thought the CofE was part of), Lent traditionally starts on Ash Wednesday (i.e. in a couple of days time). In the Eastern Church, it starts on the Monday of that week – I think it’s called Clean Monday so apparently, we are starting Lent according to the Eastern tradition (although I have no idea if they are even starting Lent this week as I think they also date Easter differently). Anyway, quite happy to start my challenges two days early but it took me by surprise. Were the Liturgical Commission informed of this change of Lenten practice? It seems Tom Allen over at BigBulkyAnglican is similarly mystified. This week I have been mostly helping the Church of England with its Love Life, Live Lent project and specifically the SMS service. Following a previous post that touched on the subject, staff at their communications office have been in touch and we’ve been trying hard to get it working with a number of emails going back and forth. I am posting again now because I genuinely want to see this project succeed. I think it’s a great idea and a great use of technology for a suitable piece of content. However, it seems that while some people are able to sign up, others of us are having trouble. Both my wife and I have mobiles on the Orange network and neither are able to get signed up. Dave Walker over at the Cartoon Church blog can’t sign up either (also on Orange) and a further friend of mine (also on Orange) can’t sign up either. So it appears that this SMS service has a bit of an issue with Orange. How can I help, Dave? I hear you asking… Well, the CofE haven’t asked for this help – but I can guarantee that it will be useful information for them in their search to get this fixed to work out if all the people having problems are all on Orange. So, please use the comments below to say whether you’ve been able to sign up or not and what phone network you use. I guess it might also be useful to know whether you’re on pay-as-you-go or a contract and what your handset is (if you are prepared to share that information). Let’s see if we can work out what the pattern is! I have finally arrived. No longer am I simply a publishing professional, happy to take the words and thinking of others and turn them into something smart. I have switched sides (albeit briefly) and I am now a published author. I even have a free author’s copy to prove it! Okay, so it’s only one page of the Ridley Hall Lent Book 2007 His journey, our journey and yes, my page doesn’t mention my name or any of the other ordinands and staff who contributed to the book (we’re lumped in a bit at the back). In fact, the eagle eyed among visitors to this blog will be able to spot my page quickly because I did previously publish my draft reflection here on this website some time ago. For several years, Ridley has published a Lent Book and they graduated to the big leagues of UK Lent Book publishing a year or two ago when they signed a publishing deal with SCM-Canterbury Press. Last year’s title sold 10,000 copies which, believe me, is A LOT for UK book publishing. This year’s book focuses on the gospel of Luke and follows Jesus’ journey from when he starts out towards Jerusalem and climaxes with the events of his death and resurrection. You might expect me to say this as a Ridley student, but as a publishing industry man I genuinely think that the Ridley Books have been a really exciting new development in the increasingly crowded UK Lent Book market in the last couple of years and it is definitely well worth a look.